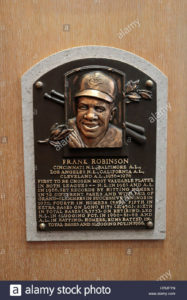 Thursday’s news of the passing of Hall of Famer and baseball’s first black manager, Frank Robinson, hit me hard. 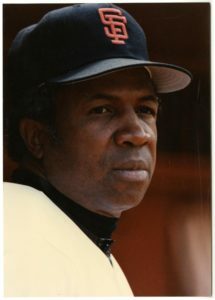 It’s been an extremely cruel off season for Giants Nation with the loss of these great past Giants, broadcaster Hank Greenwald, Hall of Famer and Giant among Giants Willie McCovey, “Dirty” Al Gallagher, Giants savior Peter Magowan and now former Giants manager and the first African-American National League manager Frank Robinson! As my tribute to the great Frank Robinson here’s a chapter excerpted from my book, Falling in Love With Baseball. Excerpted from Falling in Love With Baseball. Here’s a posting on a popular San Francisco Bay Area baseball blog on Frank Robinson’s seventy-eight birthday in 2013. 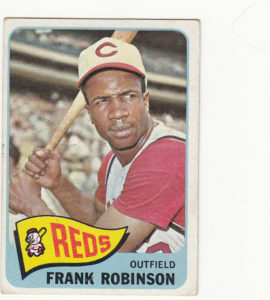 I thought that today, Frank Robinson’s 78th birthday, would be a good time to tell you my F. Robby story. In 1975 I worked as a rookie computer programmer in Oakland right across the Nimitz Freeway from the Coliseum. I used to go to the Edgewater Hyatt hotel frequently for lunch, as it was a short walk from my office on Edgewater Drive. All the sports teams who played in Oakland back then stayed at the Hyatt, and I ran into a lot of my sports heroes there at lunch. One day I chatted with Kareem Abdul-Jabbar there! Well, one fine spring day in 1975, I was enjoying my patty melt, which they did great at the Hyatt. Who sits down right across from my table at the next table? Frank Robinson, the first African American manager in major league history and a local Oakland guy! Not to mention he was one of the great stars I used to go see at Candlestick back in the early 1960s, before he was traded by the Reds in 1965 because they thought he was an “old” thirty. Talk about a stupid trade! I got excited not only by seeing one of my childhood idols this close. But also because literally minutes before I had just read in the Sporting Green that Dennis Eckersley was starting his first game as a major leaguer tomorrow! Though Eck was two years younger than me, we’d played ball against one another in Fremont where we both grew up. He was only one year behind me in high school and youth baseball leagues. “Not well, although I recall one off-field bloop double off him. He was damned hard to hang in there for a right-handed batter like me!” I said. Flustered, I blurted out one of the stupidest comments of my life—“But the paper says he’s going tomorrow, Frank”—as I pointed to the article in The Sporting Green. “He’s pitching Sunday,” he said. So with the ice broken, Frank and I had a nice conversation for a half hour or so. We talked about his days in Oakland and who my favorite ballplayer was. Of course, he thought I made an excellent choice in making my idol Willie Mays! That was my one and only meeting with Hall of Famer Frank Robinson. Oh, and how did the local kid from Fremont do on Sunday? Eck threw a three-hit shutout against the three-time World Champion A’s is all! And whom did he beat in that game? His former teammate, Jim Perry, whom the Indians had traded to the A’s for Blue Moon Odom only six days before! Who was Jim Perry, you ask? He is the older brother of Giants and Indians great Gaylord Perry. He in fact was the first Perry brother to win a Cy Young in 1970 with the Twins. They are the only brothers to win Cy Young Awards. That was Jim Perry’s last few months in baseball as a pitcher. The A’s released him a few months later that season. So here was a twenty-year-old future Hall of Famer, Eck, starting his brilliant career by beating the team he would star for as the first “closer.” And a fine pitcher, Jim Perry was, ending a nice ML career! Baseball has so many inner stories. That is why we love it so much, I guess. Duane Kuiper was a twenty-three-year-old rookie on that team, too. He was called up to the Indians for good a week or so after Eck threw his shutout. Oh, and I seem to remember seeing a skinny Kuip roaming around the Edgewater Hyatt House back in those days, too! Very cool story! Interesting how so many players careers intertwine.